Unexpectedly, yesterday, The Priest was picked up by Ereader News Today. I had entered my title in their database for the free-promotions slots a few weeks ago, and promptly forgot. Then yesterday morning I noticed The Priest’s downloads were growing at a rate short of miraculous, and I immediately checked ENT’s website—only they are capable of such results. I dug through the site a bit, and here it was Mauricio, buried at the end of the very last page of the suggested bargains and free deals, but very much alive and kicking. At the end of the day, The Priest had been downloaded 691 times. At the moment, almost noon, it is sitting at 84 downloads. My sincere thanks to ENT for picking up my book and making, once again, my day. The Priest is still gathering a handful of downloads every day, enough to pop in and out of the free bestseller chart on a daily basis. 15 downloads so far in UK. On Smashwords, 194 downloads so far. 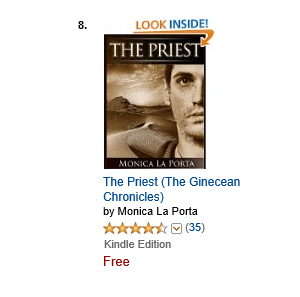 It is the second day of April, and there are only 4 downloads in the USA, which combined with the fewer and fewer downloads experienced during the last seven days has determined The Priest’s fall of grace from the Free Bestseller chart. To gain back some visibility, I’ll have to submit The Priest to all the sites that advertise free and discounted titles. But, besides the bleakness of the data, I found this while browsing, and although I know the banner shows The Priest as a suggestion because I was checking my book on Barnes & Noble, this sight still made me happy. Last Saturday, the weekend started with 1011 downloads. Seven days later, the week ended with 1130 downloads. As you can see, the number of downloads is considerably slowing down. 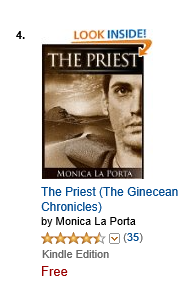 Finally, on Smashwords, The Priest was downloaded 151 times. Although The Priest is losing positions in ranking, day 5 went better than day 4 in terms of downloads. There were also 2 new downloads at Smashwords, for a total of 145.